All jokes aside, it truly is important to be conscientious of where you place your piercings in relation to each other–improper spacing can lead to very unfortunate style and other consequences. 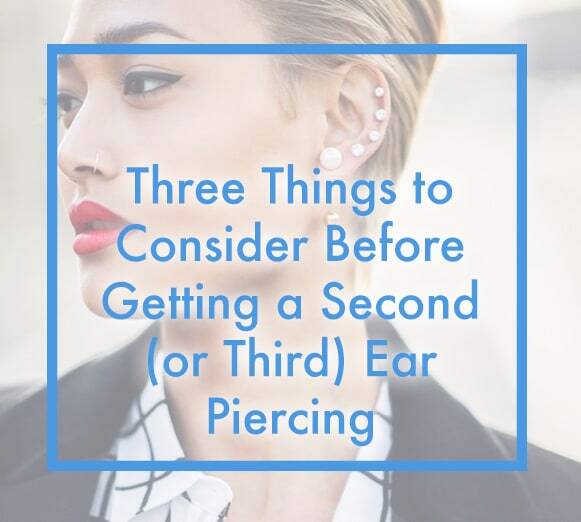 With that in mind, let’s take a look at the three most important aspects of location that you should consider when adding that second (or third, or fourth) ear piercing. #1: Allow ample separation between piercings. This may be the most obvious piece of advice you will receive, but it is without a doubt the most important. Piercings that lack sufficient spacing can migrate or merge into each other, thus causing a tear. #3: Think about the type of earrings you want to wear. Your piercings exist in order to display your favorite jewelry, so one of the most practical questions you can ask yourself would be “what type of earrings will I be wearing most?” If you enjoy large earrings, you will obviously need to allow for extra space, while small gems can be placed closer together. We hope this article has helped you to understand the importance of choosing a good spot for your next ear piercing! As you continue planning, you should also consider where you want to get your next piercing. Visit the Inverness store locator on our website to find a piercing location near you that uses our safe and gentle system. The Inverness System is used by salons, doctor’s offices, jewelry stores, and department stores throughout the U.S. and in over 40 countries around the world. If you can’t find an Inverness ear piercing location near you, please contact us on our website, and we will be happy to help!